Since embracing Twitter as a CPD source I have made many adjustments to my teaching techniques. This post reflects on my first half term using 4 key techniques and what I plan to do next. I have been using SOLO as a way of structuring success criteria. Every lesson has a learning intention which sets out what we are looking at in the lesson. I then use Success criteria to show students the different levels of understanding on their way to mastering the topic of the lesson. Students draw the solo symbols under the title of the lesson and RAG each success criteria before the lesson begins. The students were copying the success criteria down but following a tweet from Jon Tait (@teamtait) I realised that it was using time that could be spent learning so I stopped. The students remain grateful! At the end of the lesson students are then asked to reRAG the success criteria. It is immediate feedback for them as to how much learning they have done that lesson. Students have to indicate where in the work they feel they have met the success criteria which mdiscourages them from defaulting to green. They do this by placing the symbol in the margin or on the worksheet which matches the success criteria. When I first heard of #RAG123 I didn’t think it was possible to mark every book every lessons, especially as I am a head of year with a role that is mostly reactionary. I read Damian Benney’s blog post on his #RAG123 marking experiment and decided to give it a go. (You can catch up with Damian Benney’sa latest blogposts about #RAG123 marking at mrbenney.wordpress.com). Rather than take a gradual approach and see how it went, I decided that in order to test the technique I had to introduce it across all my classes. In for a penny, in for a pound! I teach 5 classes, two year 9, one year 10 (5 x per week! ), year 11 triple biology and year 11 BTEC. I get students to #RAG123 their work and effort first. As they have very clear success criteria it is easy for them to see the successes of the lesson. I then collect the books in and either circle their mark in agreement or I adjust and explain why I have adjusted their mark. I started small, initially just expecting the students to RAG mark their work. As they got used to the system and we all saw the benefits, I then started to insist on a sentence to back up their mark. I always ask them to write a sentence based on their learning so “if you are G – what do you know now that you didn’t when you walked in the room, if you are A what are you still confused about and if you are R how can I help you?” This makes my next technique much easier to manage. For #RAG123 to work, there needs to be follow-up and for maximum impact this needs to be done soon after the marking. 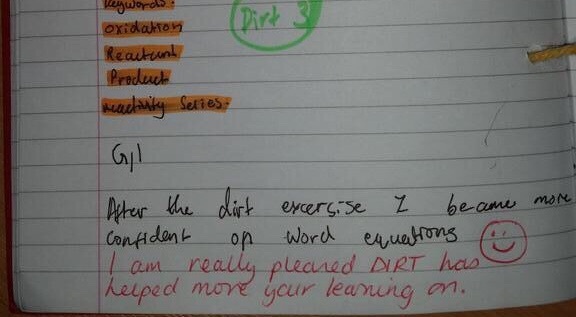 I decided to implement DIRT as my starter activity every lesson. Using a combination of reading the work produced that lesson and the students comments I assign the student an activity to move their learning on. This activity might be to clarify a misconception, to fill in the gaps if a student was absent or to extend their knowledge further. I assign the DIRT activity a number and this is written in their books. When the books are handed out I put the DIRT activities on the board with the corresponding numbers and students spend 5 minutes completing the task. Ask any of my students what colour is Ms Browning’s DIRT, they will all reply “green”. One even went as far as to suggest I should rename it DIRTY. when I asked why he replied you have to do it yourself! The final technique I implemented with all my classes was takeaway homework. All classes were invited to join me on google classroom and were given a copy of the takeaway menu. In place of dishes were a variety of tasks that students could choose to compete over the half term. students could choose any task to complete as homework. The only rules were that they had to do 12 chillies by half term, could not repeat a task unless we had changed the unit and had to submit something each week for marking. SOLO – following my MA research and continued use of SOLO in class, I have been asked to run a series of teaching & learning briefings next term to get the SOLO technique out to the whole school. I have renamed each level as students were put off by the terminology. Uni structural is now building, multistructural is developing, relational is securing and extended abstract is mastering. My students prefer the new names. I think it is because the language is more familiar to them, they are able to remember what level they are working at. We call it levels of challenge and when asking them to move to the next level I talk about increasing the challenge. I think this will help to bring more staff on board when I introduce it later this term. #RAG123 – the students absolutely love it. They are excited and engaged at the start of my lesson because they want to see if I agreed with their marks and what DIRT activity I have given them. They are getting used to writing a sentence to justify their mark but I still get the odd “I need to work on success criteria number 2” or “I did all my work well”. This is just students getting into the new habit of working. I have had two parents evenings (year 11 and year 9) and the feedback was overwhelmingly positive. My students will tell you like it is so they weren’t just saying positive things to please me! At first I was taking too long to mark a set of books. why? Because I was writing a comment on every book. I had to check myself! 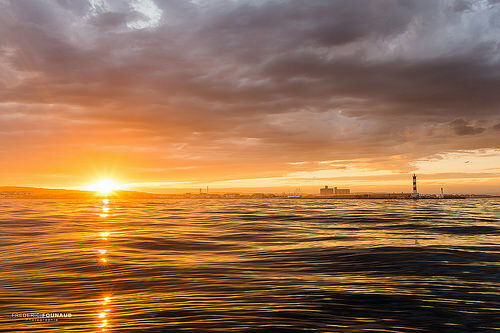 Once I got over the feeling I wasn’t doing it properly, I relaxed into it and only made comments where it was necessary. I got into the habit and marking the dirt activity and reading their work to set the next DIRT activity. I could get through a set of books in 5-15 minutes even when marking the DIRT activity. Did I mark every lesson? No but then I never expected that I would. The biggest gap between my marking is about 1 week, maybe 2 weeks with a couple of classes. Did this discourage me from using this as a marking system? Quite frankly no! For the first time in my career I am enjoying marking and even if there is a gap bigger than 1 lesson, the students still #RAG123 every lesson and I have these comments to look back on. DIRT – I love DIRT and so do my students. They have commented that it allows them to improve and move up to the next level of challenge. It also allows them to correct mistakes straight away rather than in 2-3 weeks time. DIRT is personalised, allowing for absent students to catch up and more able students to be stretched. It gets marked so any remaining misconceptions can be picked up on and challenged. It is evidence of progress without killing the teacher to get it evidenced and, I suppose a form of double marking as they are given the rag rating then they complete the dirt activity then this is checked. If I don’t mark their books I still get them to complete DIRT activities but I ask the student to judge which one is the best to move their learning on. 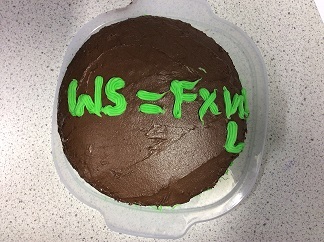 Takeaway Homework – I have found this to be the best homework I have ever set! I have had websites, PowerPoint, top trump cards, posters, tweets, poems, songs, crosswords, collages. The list goes on. I have adapted how I set this homework from early experience. In order to keep my sanity I have given all students the same deadline, regardless of which class they are in. All students have to submit either a written copy by 4pm on Friday or an electronic copy by 11:59pm on Friday. I have also taken to marking the home work using #RAG123 as this is the most efficient way of doing it and all the students know and like this system. I am changing the menus after half term, just to keep it fresh and I want to provide exemplars for completing the home work as it has been difficult to ascertain which task they are completing without a title! Finally my books have gone though 2 department learning walks and book scrutinise and 2 SLT learning walks and book scrutinies. 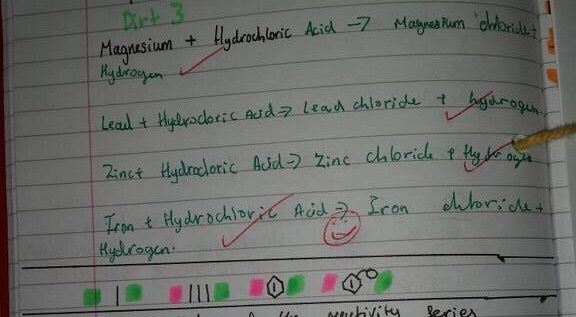 The feedback from my head of department is that he wants me to share this technique with the rest of the department and has identified me on our science bulletin as a ‘go to’ person for managing marking load. I have shared #RAG123 and DIRT with staff outside of my department and they were very insistent that I share it with the whole school. I am now scheduled to do this in a teaching & learning briefing after Christmas. This has been the least stressful first half term in my teaching career (14 years!) and I am taking my year group through their final year at the school. I have tried and tested these techniques in all my classes this half term and they are now firmly in my daily teaching practise. Will I worry if I can’t mark their books religiously every lesson, no because I know that what I am doing now is so much better than what I was doing before and the students are benefiting from my improved practise. 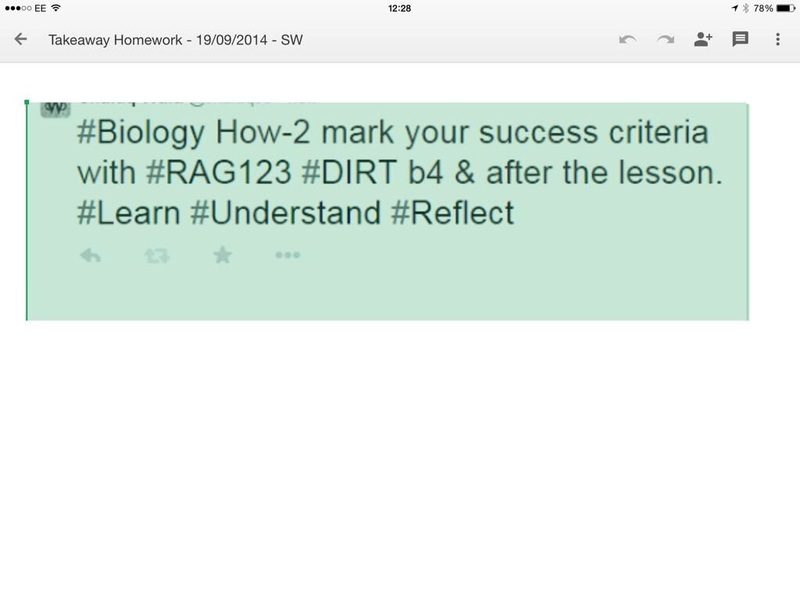 RAG123 for marking HW – genius. I will give that a go next term. PreviousReflections on Becoming a Head of Year.